Based in Colorado Springs, Vanessa Newman writes for "Women's Edition" magazine and has been published in "Rocky Mountain Sports," "IDEA" magazine and "The Teaching Professor." She has been writing professionally for over 10 years and holds a master's degree in sports medicine. She has written online courses for companies such as Anheuser-Busch and Chevron, but prefers creative writing. There are eight specific B vitamins that the body needs for proper functioning. Too little of one and you are deficient, which can lead to unpleasant and even devastating symptoms depending upon the one you are lacking. Too much of a particular B vitamin and you may experience signs of overdose. Hives, rashes and heat are several of the commonly reported symptoms from excess B vitamins. Vitamin B-1 is called thiamine. B-2 is riboflavin, and B-3 and B-4 are referred to together as niacin and niacinamide. Pantothenic acid is B-5. Pyridoxine, biotin and folic acid are B-6, B-7 and B-9 respectively. Hydroxy, or cyanocobalamin, is B-12. In general, B vitamins are involved in proper nervous system functioning, promote muscle tone and get depleted during times of stress. Throughout an individual’s life, B vitamins are required in various doses. The dietary reference intake gives a recommended range necessary based on age for good health. Women who are pregnant have different requirements for B vitamins. Vitamin B-1, or thiamine, in excessive doses can cause skin eruptions such as pimples or hives. Additionally, too much vitamin B-3 and B-4, or niacin or niacinamide, may cause skin reactions including hives. Also, B-7, or biotin, in large doses is responsible for skin eruptions in the form of hives or other skin reactions. Rashes are red areas or blotches on the skin that may be itchy or irritated or become infected. Although it is difficult to always diagnose the source, they are common. 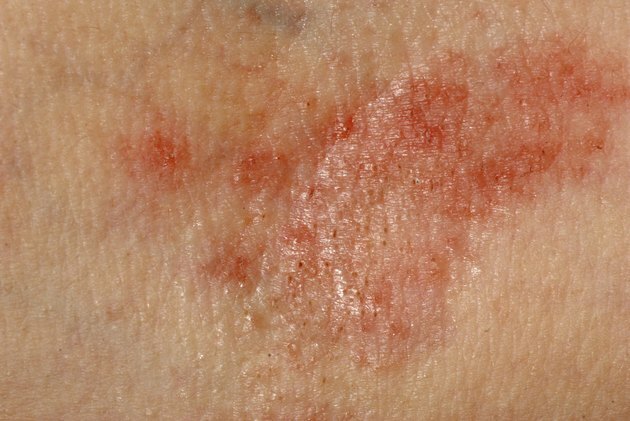 An excess of vitamin B-3/4, or niacin and niacinamide, has been known to cause unpleasant rashes in some people. A rash may also be a sign of an allergic reaction to folic acid, or B-9. Although this is rare, it can occur as a result of taking this B vitamin. The sensation of heat all over the body and particularly on the face is also referred to as flushing. Usually, too much B-3 or B-4 in the system will trigger this negative reaction according to Acu-Cell Nutrition’s website. Too much of this particular B vitamin can also cause nausea, sweating or insomnia or allow the body to lose too much calcium. Additionally, if you get injections of Vitamin B-1, or thiamin, although it is a water-soluble vitamin, the injections can cause heat, warmth and sweating according to Vitamins and Health Supplements Guide’s website. Can Taking Vitamins Cause Irregular Menstrual Bleeding?